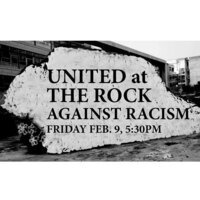 Hosted by the UTK Campus Ministry Council, with support from the Student Government Association and the Faculty Senate, UNITED AT THE ROCK is a candle light gathering intended to be inclusive of all people, regardless of religion as well those who are not religious. The goal of the gathering is to give all people, guided by their faith or moral conviction, a shared opportunity to take a stand against racism and hate. Hand printing on the Rock at 3:30pm, with the gathering commencing at 5:30pm. It was a good start, but most I talked to were uncertain about a schedule or program. When the Chancellor arrived, we expected her to speak, but apparently that was not part of the plan. It was ok - for a start - but not great. For future events, we just need more detail. I got there at 3:30, but headed back to the office at 4:30, as people were just milling around. The handprint rock painting was a great activity - but significance was not really explained. It was great to join so many fellow faculty and students in our efforts to create an inclusive campus!